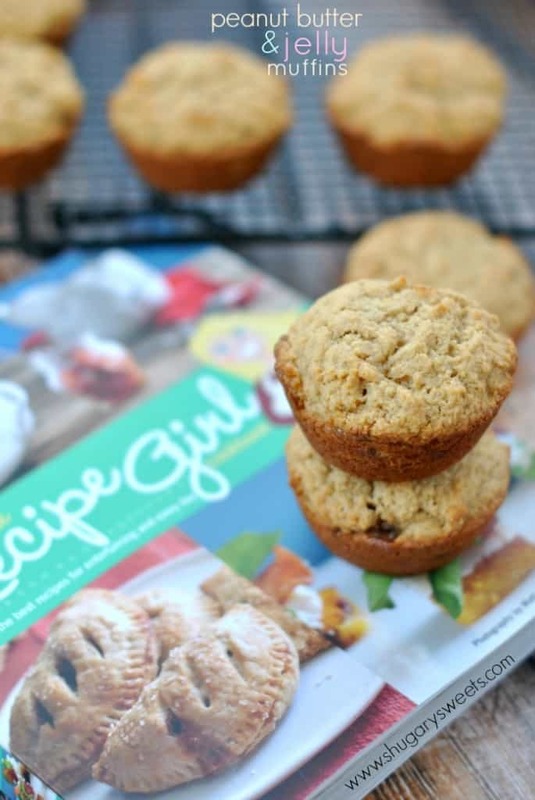 Peanut Butter and Jelly Muffins from The Recipe Girl Cookbook are so moist and delicious! These are perfect for breakfast, school lunches or after school snacks. 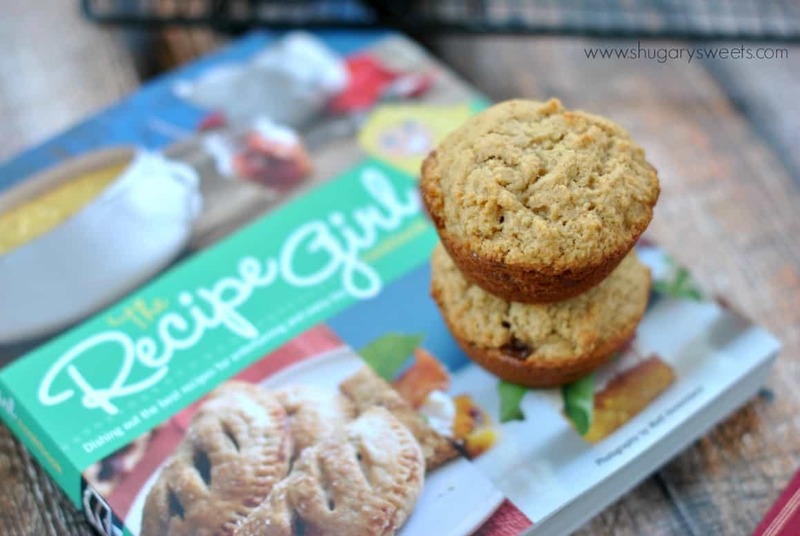 Also, look for the GIVEAWAY at the end of this post for a copy of The Recipe Girl Cookbook!! I’m always looking for ways to add more peanut butter to our lives. My kids are all underweight. I know. Weird right? I wish I had that problem. They are great eaters, they love their fruits and veggies. All but one of them will eat pretty much eat any dinner I put on the table (yeah, I’ve got one semi-vegetarian who will take ONE “no-thank you” bite of meat). Adding peanut butter to smoothies, baked goods and sandwiches is a great way to give my kids an extra boost of protein and calories. And my kids LOVE peanut butter. I’ll be honest. There are days that I crave a peanut butter & jelly sandwich. I like my sandwiches DRIPPING with PB and jelly. When Lori gave me a copy of her cookbook, I was in love. I have so many pages dog eared and ready to make. But as I was initially thumbing through this book, the Peanut Butter and Jelly Muffins caught my eye immediately. I love how Lori’s cookbook is so user friendly. She has “change it up” tips on every recipe to give you a fresh idea using ingredients you may have on hand! These muffins, as expected, did not disappoint. I love that the recipe made exactly one dozen muffins. Admittedly most of my recipes call for an odd number of muffins and cupcakes. For the jelly, I used a natural strawberry preserve to keep the sugar down. However, a couple of my kids thought I should have used either more jelly, or more “sugared” jelly. Yeah, they are my kids, hehe!! Anyways, I’ve got great news! Lori and I have teamed up to give one of YOU a copy of her cookbook. How cool is that??? Use the rafflecopter below (you may need to give it a minute to load) and follow the instructions to enter! You’ve got one week, so enter now…then go back some muffins! If you don’t want to wait to win, go buy yourself a copy on Amazon! Worth it, I promise! Spray 12 muffin cups with nonstick baking spray. Set aside. In a medium bowl, whisk together the flour, sugar, baking powder and kosher salt. Set aside. In a second bowl, whisk the milk, peanut butter, oil, egg and vanilla together. Stir the wet ingredients into the dry ingredients and mix until combined. Do not over mix. I used a 2 Tbsp scoop and put batter into the bottom of each muffin cup. Spoon a large teaspoon of preserves onto the batter. Top with remaining batter, dividing evenly among the muffins. Bake in a preheated 350 degree oven for 20-25 minutes. Remove and cool completely. ENJOY. Those muffins look fabulous! 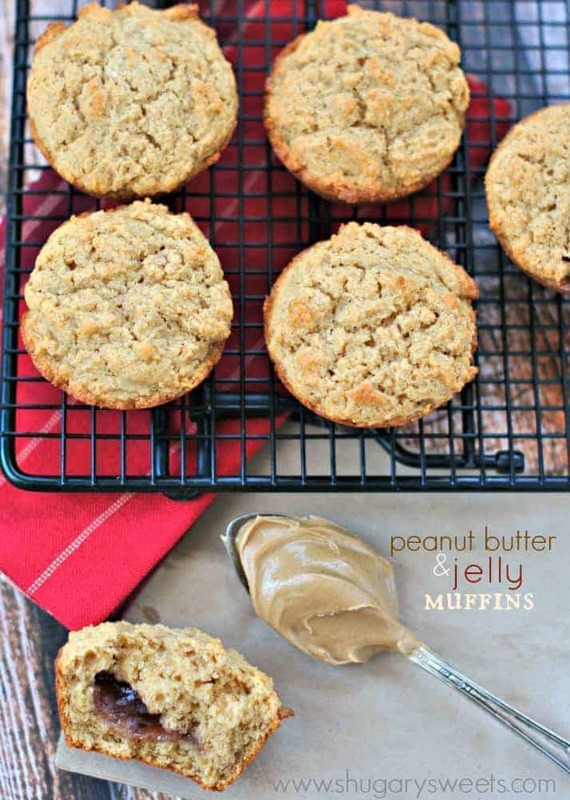 Peanut butter-banana muffins are my favorite, but you can’t go wrong with PBJ muffins either. Brown sugar/coconut oil/oat muffins. So yummy. I am such a kid at heart, I love peanut butter and jelly anything! These would be a perfect breakfast or afternoon snack. Thanks for the giveaway! My favorite would have to be Blueberry Muffins. I LOVE anything with peanut butter!! These muffins look so yummy. I cannot wait to make them. My favorite muffin…probably any banana muffin! I heart them all!!! Love these fun muffins from Lori’s book! That jelly pocket is calling my name! These muffins look amazing! Might have to swipe out the strawberry jelly for raspberry. That’s my favorite! Thanks for the giveaway. i love blueberry muffins with lots of blueberry’s. thanks for the chance to win! cookbooks are my favorite reading material. Can’t wait to try thee. A friend just gave me a giant jar of peanut butter. I like blueberry muffins the best but have made a rule to never turn down any type! My favorite muffins are banana chocolate chip. These sound so yummy! 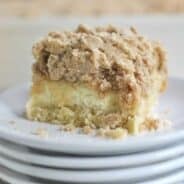 I will be pinning the recipe to try. My favorite muffin is chocolate chocolate chip. These look fantastic! I think we will try them tomorrow. Thanks for the recipe. Aimee I’m so glad I’m not the only one who like dripping peanut butter and jelly sandwiches. sometimes I make myself one along with the kids and it’s little ridiculous how much jelly I put on…Love these muffins! Lori’s recipes are just the best. My favorite muffin is blueberry vanilla streusel!! I honestly don’t think I’ve ever met a muffin that I didn’t like!! These muffins look great. I can’t wait to try them. My favorite muffin recipe is a whole wheat banana chocolate chip muffin. So moist and yummy!! I love lemon raspberry muffins!! I love a blueberry muffin!! can i use vegetable oil instead of canola? Yes, that would be just fine! These look amazing! Blueberry muffins are usually my favorite. Love PB&j…can’t wait to try these! My favorite muffin is wild Maine blueberry. I love chocolate chip muffins, it’s a classic! I love lemon poppyseed or chocolate chip pumpkin! heyyyy… i love blueberry muffins. These look delicious!!!!! 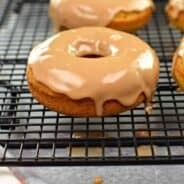 I’m going to try gluten free flour to make these!! As for me I guess that these muffins should be decorated somehow. I have no doubts as for their taste but I guess that they should be covered with some cream or something like that. It will make them more vivid. Want to try these for the grandkids! These looks so good, can’t wait to try! My favorite muffins are cherry chocolate chip. Love the idea of these muffins! Peanut Butter and Strawberry Jelly is my favorite! Can’t wait to make them! Saw this recipe last night. Ran to Publix this morning for Jam. Making the muffins now. Couldn’t resist the deliciousness. My babies and hubby thank you. These look delicious!! I do love a good chocolate muffin, or blueberry crumble! I love Pumpkin muffins !! Pumpkin is a big favorite in our house! I love blueberry lemon muffins. 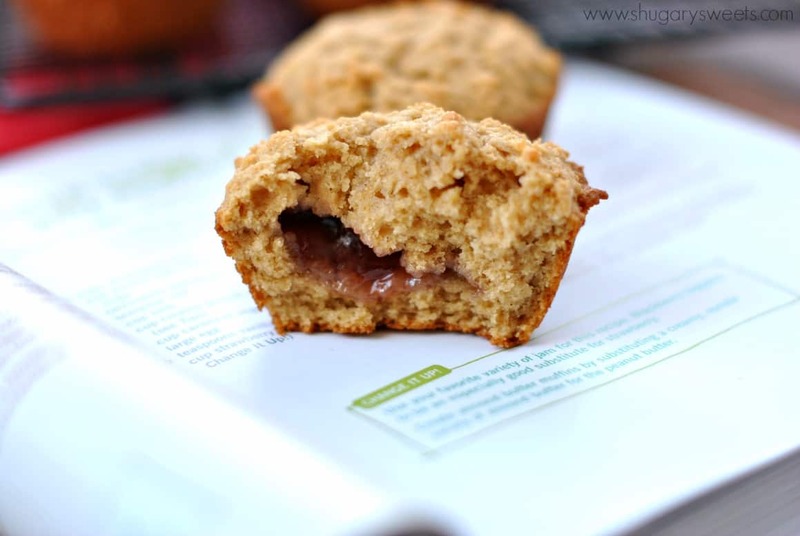 My kids LOVE muffins – these look fantastic. The muffins they request most often are Banana Apple Muffins. I love banana nut muffins and enjoy trying new muffin recipes also. I love blueberry muffins, but red velvet muffins are a close second. Will be making these muffins for sure! My kids would LOVE them! I also like savoury muffins, especially pumpkin or cheese/herb. Those look wonderful and I would love to win the cookbook! My Favorite Muffin is pumpkin muffins, they are so good! Love the recipe from my mother’s Betty Crocker cookbook for blueberry muffins – made with the first blueberries of Spring! I love Muffins that taste like Donuts!! Hi. I have to say my favorite muffin is pecan pie. Yum! Thanks for the giveaway. Good luck everyone. I think my husband would love these! I will have to make them this weekend! Peanut Butter and Jelly anything is a huge hit in my family thanks! Any blueberry muffin is my favorite, especially with a crumb topping! All muffins are good muffins especially with crumbly toppings! My family loves muffins of all kinds. Chocolate with chocolate chips are my favorite. Thanks for the giveaway!!! bluberry crumb are my fave….have to try these too! I like almond poppyseed muffins. I’ve heard about a pb&j cupcake, even tried it once; it was the most moist cupcake I’ve had so far.. But no recipes until now! 😉 tnx! I really love lemon poppyseed muffins. Yum! I love to make “French Breakfast Puffs” they remind me of when my mother made them when I was a young kid. I love to make my own peanut butter so I love finding new recipes that incorporate my homemade peanut butter! I LOVE muffins…so hard to pick just one!! I guess blueberry would be my favorite. Even my semi-grown up kids would love these! Love your postings and would LOVE your cookbook please. Just made a batch of lemon poppy that rocked my socks. Hi!! Thanks for doing the giveaway! Blueberry Muffins are still my best treat. I love blueberry or cranberry muffins a lot and I make a mean banana nut muffin too! I’ve never met a muffin that I didn’t like! Hi! This recipe sounds good. 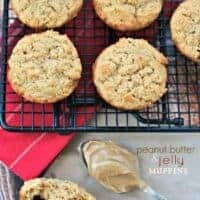 I love pumpkin muffins, but Peanut Butter and Jelly is one of my favorite combinations, this recipe is next on my list! Hi! just found your site and these muffins look soooo good! The classic Lemon Blueberry muffin with almonds & lemon zest sprinkled on top. These look good. I like banana/chocolate chip muffins or a nice cornmeal muffin. This sounds crazy, but my grandmother used to make the most amazing melt-in-your-mouth bran muffins!! We are so sad not to have the recipe anymore. My favorite muffin is pumpkin chocolate chip. I have to give these muffins a try. I am a huge sucker for Lemon Poppy Seed muffins…or anything involving streusel on top! A bakery style chocolate chip muffin is my fav! I would love to win this book~Thank -You. I don’t really have a favorite muffin. I do love them. Right now, I’d probably go with banana chocolate chip. 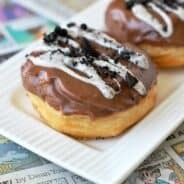 I just made these on Monday and they were oh so good. I made cranberry muffins recently that were great! I love muffins! My favorite are the cinnamon puffins, but I also love an old standby, blueberry muffin too. Your peanut butter and jelly muffins looks wonderful.